A specially selected Training Officer, holding a Master’s Certificate of Competency, was placed in charge of each Cadet Training Unit. He supervised the Cadet’s studies, helped to organise their recreation and was ready to advise them on personal matters. A full crew was carried part from the Cadet Training Unit and the unit was aboard solely for training. That made it possible for a very wide range of activities to be tackled. Reference books were provided for the Cadets. Most routine seamen’s jobs were explained and undertaken at this stageand there was an introduction to the practical techniques of navigation. The Board of Trade recognised the value of training in a Cadet Training Unit and awarded an additional one month’s remission of qualifying seatime to a Cadet who satisfactorily completed six months or more in a Unit. By the completion of Phase I, after six months to a year, the Cadet had the necessary practical and theoretical experience to enable him to become a valuable member of a ship’s company in Phase II. From my distant memories, The Davidson pre dated what became the norm for the Cadet Training Units and the Phased Scheme, which I think came into being after Capt. Raymond Hart became Nautical Adviser. I think the Davidson's Cadet Unit was more of an experimental idea with someone, perhaps Captain Mitchell, having looked at the schemes being run by NZS and B I, thought the Company should look at the way Cadet Training was undertaken, and were there to be benefits in having a dedicated officer in charge of the cadets. At the start of my cadetship, whoever was the longest serving cadet on board with sea time was deemed the senior and it was he who went to the Chief Officer to get the orders of the day, which were quite often go and see the bosun or chippy, where one joined crew to learn the skills, or even teach one's self from the experience of the senior cadet! I was still serving as a Cadet when we heard of this new idea on the Davidson and was filled with a degree of horror that there was the possibility of being seconded to her. I think her unit was not just for first trip cadets, but perhaps your records may prove to the contrary. Off the top of my head, the Sutherland was the first of the ships at the end of her passenger carrying life to be converted to a Cadet Unit under the revised training scheme, which I think came into being circa 1965? 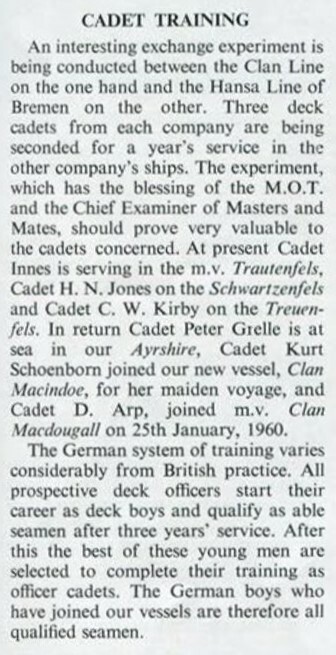 I see Keith Parker attended the recent Clan Line Reunion, and it was either he or Mike Banbury who were the first appointed Training Officers of the time. There has to be a 4 year plus gap between the scheme operated on the Davidson to that being undertaken on the revised MNTB recognised scheme in the mid to late 60's onwards, and the use of the other named vessels. After the formation of The British & Commonwealth Group, several ships were deployed as Cadet Training Units. 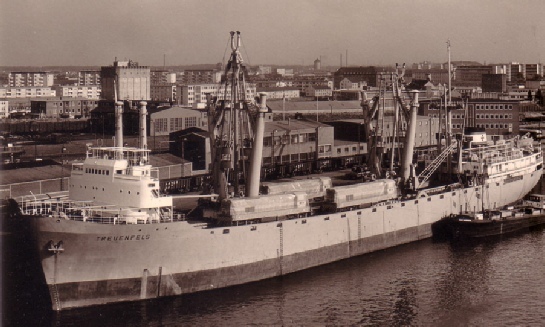 They were all ships that had passenger accommodation that was turned over for the use of senior officers, junior officers were given larger cabins and the cadets were housed in the old junior officers cabins. Passenger public rooms were used by the officers and the ex officers public rooms were turned into lecture rooms for the cadets.